It is the IPL season and cricket lovers are clearly gripped with the T20 matches. It is the 12th season of the game and those who absolutely love cricket always follow the scores religiously, especially when their favourite teams are on the ground. But it is not always possible to keep a track of the entire match for those who are on the run. A taxi driver from Telangana, a die-hard IPL fan decided to run the scores atop his taxi, not just benefitting him but also others on the way. The picture was shared on Reddit and went so viral that even the International Cricket Council (ICC) shared it on their Twitter account. Funny RCB Memes Trolling Virat Kohli & Co. Don’t Stop! Hilarious Tweets & Jokes Go Viral Following RCB's 6th Consecutive Defeat in IPL 2019. 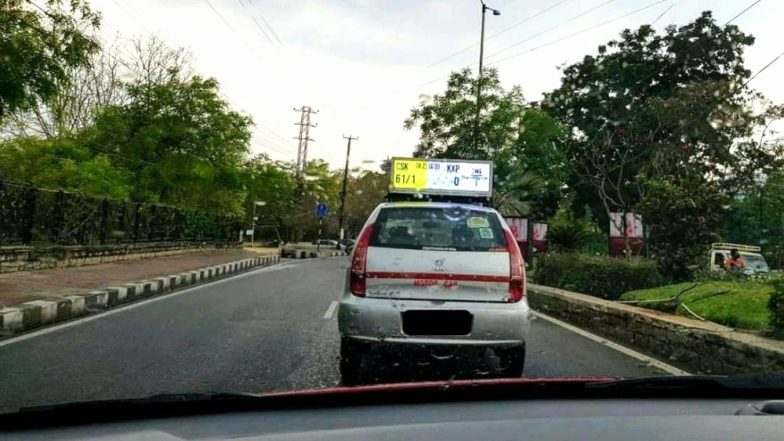 A Reddit user shared the picture of this taxi driver who displayed a live scoreboard of the match between Chennai Super Kings and Kings XI Punjab. We are sure fans would be so thankful to him and indeed the gratitude was even pouring in on social media. Several users commented that he is doing god's work and someone said, 'Not all superheroes wear capes.' ICC too took notice of the same and couldn't help tweeting it. Beat The Heat! Kolkata Auto Driver Makes a Garden on Top of His Rickshaw to Give an Important Message. People on Twitter absolutely resonated with the 'It happens only in India.' Check how people on Twitter reacted on this picture. As some rightly say cricket is like a religion in India and thus this man is no less than God for those followers. Thankfully this taxi driver will ensure that people around him don't peak into their smartphones often to check the scores. He is indeed doing a brilliant service for the ardent fans.